Call Custom Garage Works Today To Get Started With Your Dream Garage! Have you been looking for durable, showroom quality, easy to clean garage flooring options? Are you searching for professional grade cabinets that can hold your heavy tools, in hot, cold, or ideal temperatures? Do you want an organized, usable garage instead of something that resembles an overstuffed and cluttered storage unit? We started Custom Garage Works in 2003 because we wanted all of those same things. However, when we went to look for professional help, we were surprised to find the industry wasn’t able to provide us with a professional level of service for a residential garage. So we set out to provide the ultimate home garage services, and with us, that’s what you’ll get. Call us today at 214-494-9068 or 817-308-1305 and speak with one of our qualified professionals. At Custom Garage Works, you will always have one of our two owners onsite at your installation, and all of our employees are full-time and fully trained. We don’t outsource our work or hire contractors on a day-to-day basis. This means that your project will be completed to perfection by skilled professionals. We are happy to educate our customers on every service we provided, and we love to answer questions about our work. 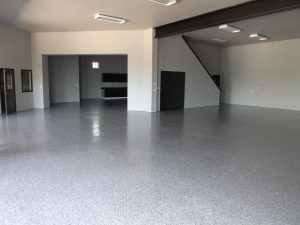 Before you settle on your garage flooring or cabinets, we provide a CAD rendering of your garage with the new installments, so you can see the finished result before we even begin working. We take the guesswork out of designing your dream garage, so you can feel confident about the investment you make. With a custom garage from Custom Garage Works, you can have more storage, more organization, a better floor, and more. We even offer free estimates! Call us today at 214-494-9068 or 817-308-1305 to get started. Updated on July 13, 2017 at 1:18 pm by Custom Garage Works.